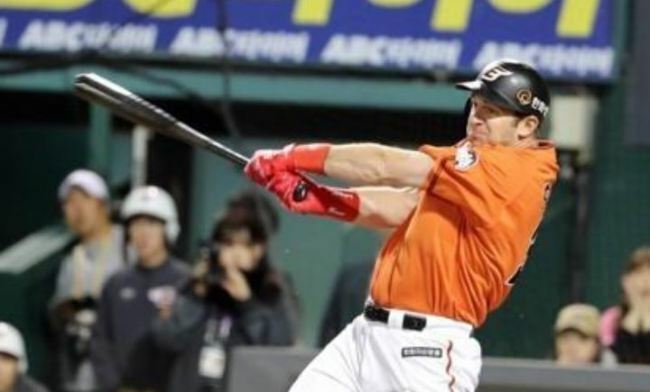 South Korean baseball club Hanwha Eagles said Wednesday they'll bring back outfielder Jared Hoying for one more season. The Korea Baseball Organization team said Hoying, 29, will return on a new one-year deal worth $1.4 million, with $800,000 in salary, $300,000 in signing bonus and another $300,000 in option. Hoying made $400,000 in 2018 with a signing bonus of $300,000. The KBO has put a salary cap of $1 million on new foreign players coming to the league, and it doesn't apply to returnees. The former big leaguer launched 30 home runs, stole 23 bases and drove in a team-high 110 RBIs in his first KBO season in 2018, while slashing .306/.369/.573. Hoying also set a KBO single season record with 47 doubles. With versatile Hoying offering power and speed on offense and a steady glove on defense, the Eagles finished third in the regular season and made their first postseason in 11 years. KBO teams can carry up to three foreign players, at least one of whom must be a position player, and the Eagles have completed their import signings for next season.